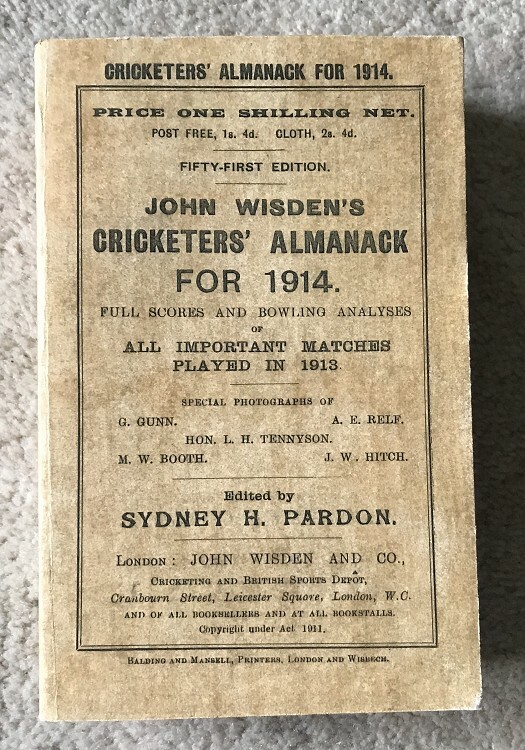 This lot is an Original 1914 Wisden Paperback with facsimile spine & facsimile front cover - Original Rear cover. 2 adverts at the front are facsimile. This is in OK condition, the facsimile cover is very well made as is the spine. The rear cover is original but has some wear. In general the book has a read feel with some thumbing, nice enough inside just the iodd mark and light crease within. Nice photoplate, new spine & cover & advert professionally added which makes the book readable and stops it falling apart. It mimics the original spine & covers and nicely blended together.